At Travelworld Motorhomes, we love being efficient and productive, and that gave us a thought; what if we could share some of the ways our team excels at its tasks with readers of our blog? The more we considered it, the more we realised the productivity techniques we rely on at work can benefit us all at home, too! Successful people are extremely productive people. But what is productivity? It’s something of an ethereal quality, yet we know precisely how it benefits us at work. By being as productive as possible, we get more stuff done – it’s that simple. And, by getting more stuff done, we become more successful, learn new skills and become a better, more rounded individual. As win-win situations go, productivity has it all. So, what if you applied business productivity exercises to your home life… what would happen then? Think of the ideas you’ve had while wandering around the house, going about your everyday life. You can’t, can you? Because you’ve long since forgotten what they were. Writing stuff down is something most of us do constantly at work. While on the phone, chatting to colleagues or attending meetings, pen regularly touches paper in order to record comments, thoughts and ideas. Do the same at home; if a great idea strikes you or if you suddenly remember something you absolutely need to do next Tuesday – write it down. You’ll never address it later if you don’t. You’ve been meaning to trim the overgrown hedge in your front garden for weeks now, but it’s got so bad it’s beginning to encroach on the people walking by. If you don’t set yourself deadlines to which you resolutely stick, you’ll never get anything done. Even for the smallest, most innocuous of tasks, make sure you set yourself a time by which it must be completed, and get into the habit of coming good on your promises. 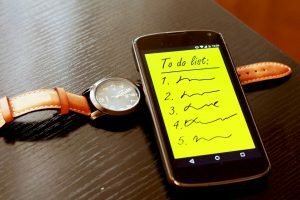 Being at home isn’t a 9-5 job, so there’s certainly no need to treat it like one, but by introducing some scheduling into your personal life you should find that you’re able to spend more time on the things you love doing. Apportion your time between house chores, entertaining others, seeing friends, spending time with your family and conducting that all-important ‘me time’. Ok, so you’re at home and you really want to dig into that boxset. And why not? However, too much procrastination can result in projects being delayed, so if you find yourself doing something relatively meaningless when you know there are more pressing jobs to be undertaken – always go for the latter. The ultra-productive among the working population generally have very tidy desks. When things are completed, they’re filed away; everything that is in view is either in progress or ready to one taken on. Do the same at home by decluttering regularly and putting stuff in designated places. The tidier your home, the tidier your mind and the more time you’ll have to indulge in the things you love doing. When was the last time the kids did the hoovering? If you feel like there’s too much to do at home, involve those closest to you – it’s their house, too. Very little comes for free in life. If you apply our work-based productivity tips to your home life and mix them with a good, old-fashioned desire to work hard on the things you love doing, you’ll get more done than you ever thought possible.